The Kestrel project is all about freedom of computing and the freedom of learning using a completely open hardware and software design. This project was created on 03/06/2016 and last updated 14 days ago. With each passing day, technically capable consumers of computing technology increasingly lose their rights with computer hardware. While some look to prominent Linux suppliers as an escape from the Intel/Microsoft/Hollywood oligarchy, I have taken a different route -- I decided to build my own computer completely from scratch. My computer architecture is fully open; anyone can review the source, learn from, and hack it to suit their needs. No back doors. No hardware locks or encryption. Open hardware means you can completely understand the hardware. No memberships in expensive special interest groups or trade organizations required to contribute peripherals. No fear of bricking your computer trying to install the OS of your choice. Bootstrap process is fully disclosed. Designed to empower and encourage the owner to learn about and even tweak the software and the hardware for their own benefit. Built on 64-bit RISC-V-compatible processor technology. More precisely, the Kestrel-3, my third generation design, aims to be a computer just about on par with an Atari ST or Amiga 1200 computer in terms of overall performance and capability, but comparable to a Commodore 64 in terms of getting things to work. This block diagram illustrates my vision of a Furcula-to-Wishbone bus bridge. The KCP53000 CPU exposes a Furcula bus for both its instruction and data ports. 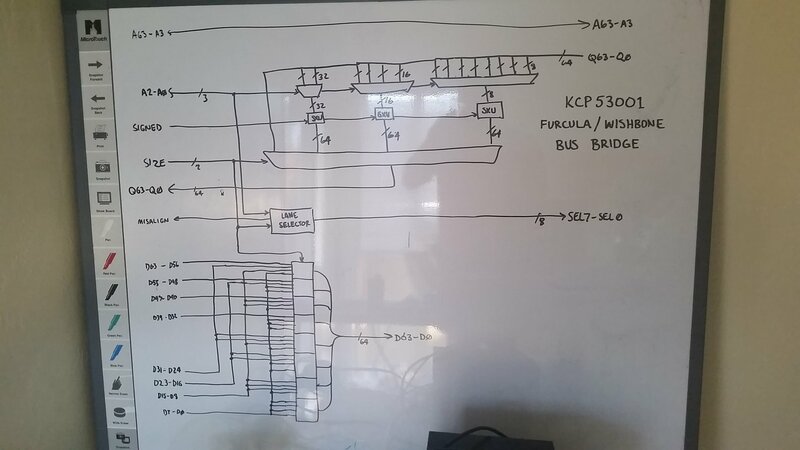 Once these buses are arbitrated to a single interconnect, the KCP53001 is used to talk to Wishbone peripherals and memory. 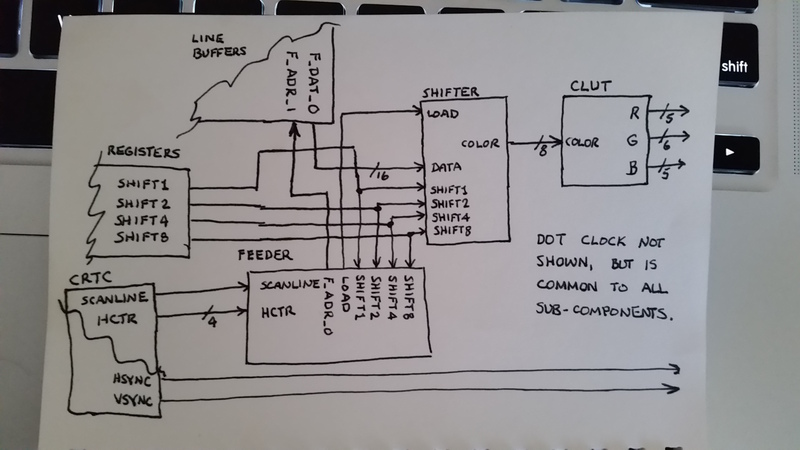 This block diagram illustrates how the pieces of the CGIA fit together to serialize graphics data to the VGA port. Here, I draw a GEOS-inspired dialog box-like thing, interactively as you can see. 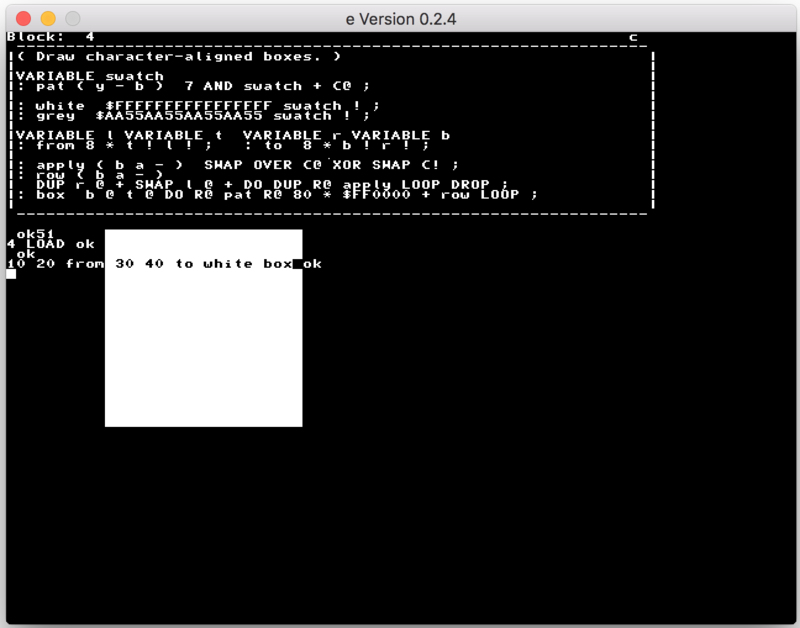 Here, I'm writing software to draw simple boxes to the screen using the XOR operator directly on the framebuffer bitmap. Finally got block storage working inside the emulator, and along with it, a visual block editor. It's based on my own Vi-Inspired Block Editor (VIBE). I&apos;m happy to report that I&apos;ve completed the CSR Unit, or CSRU for short. This is the block of logic which implements all of the CSRs (Configuration and Status Register) mandated by the RISC-V Privilege Spec 1.10 as of this posting. It&apos;s my first real implementation of logic using nmigen as a hardware development tool. And, I must say, I&apos;m really quite impressed with it. The CSRU takes up 1157 of the 7680 logic cells of the iCE40HX8K FPGA. This might well be entirely too big for the finished design, however. If I remove all of the performance counters, some of the useless read-only registers like MARCHID and MVENDORID, etc., I can drop the resource consumption down to 769 LCs. And, I can reduce this still further by ignoring the priv-spec requirement for WLRL fields (treating them instead as WARL fields, as the original KCP53000 does), which will let me throw away 59 of the DFFs used to build out the MCAUSE register, just to name one example. Also, with the CSRU as-is, the fastest clock speed is just a smidge above 50MHz. This isn&apos;t very much, unfortunately; once the rest of the processor is implemented, I predict the completed processor circuit will need to be clocked somewhere in the 16MHz to 25MHz range. Of course, reducing the CSRU complexity will help drive maximum clock speeds higher, but not by much (52MHz in the above example reduction); and, it&apos;ll come at the cost of no longer being compatible with the RISC-V priv-spec. For now, I&apos;m going to stay the course with the 1157 LC design, knowing that it&apos;s just a few small tweaks to the source code to enable or disable certain features. Using a higher-level HDL representation like nmigen is a big confidence booster for experimenting with different design configurations later on. According to my personal project plan, my next step is to work on the Integer Execution Unit, or IXU. This is the state machine logic that handles actual instruction execution. It&apos;ll accept instructions from an instruction queue (IQ), rather than fetch them directly. It&apos;ll also be responsible for helping to detect and act upon interrupts and synchronous trap conditions as well. I&apos;m happy to announce that the Kestrel-3&apos;s Serial Interface Adapter (SIA) core is now hardware proven and works reliably. This is a major stepping stone towards the evolution of the Kestrel-3 design. The complete test circuit comes to about 495-ish look-up tables, which is surprisingly large for how limited the SIA is; however, it&apos;s at least not gigantic either. Only after the 53000 processor has been ported to run on the Kestrel-3 will I start work on the RAMA core. Once both the 53000 and the RAMA core are implemented, I can then try to port the Kestrel-3 port of DX-Forth onto the platform. This will also involve somehow using a second SIA core for a prototype mass storage interface as well; not having the ability to load and save blocks of source code would be a severe inconvenience. Regrettably, at this point, nothing will be DMA-driven. But, interrupts will be supported, so there&apos;s that. Finally, after all that is done, I can start to design the next-generation processor, the 53010. I&apos;m currently encountering significant difficulties using Verilator to write some integration tests for the Kestrel&apos;s SIA (Serial Interface Adapter) core. Formal verification says everything should work, but Verilator is giving completely different results. Some external help from ZipCPU suggests that the problem lies in the specific subset of Verilog I&apos;m using to write my core&apos;s logic, so I&apos;ll be looking to retrofit the cores as time permits. Unlikely to be this week or next, though, due to holidays. Hopefully, I can get some time in to fix this before December though, as I&apos;ll be busy with a whole new set of holidays! The relatively recent and on-going legal actions between Cloanto and Hyperion Entertainment has me concerned about implementing VertigOS as a port of the BOAR Project. The BOAR Project is a clean-room implementation of a proper subset of AmigaOS. including only the exec.library and dos.library components of the operating system. While not binary compatible with AmigaOS, it should be source compatible with a large number of native AmigaDOS console applications, particularly those which treat BPTRs as opaque references. (BOAR implements all DOS pointers as APTRs instead of BPTRs.) BOAR&apos;s library and device driver APIs are sufficiently powerful to enable a significant reproduction of actual AmigaOS libraries (albeit disk-resident) that, frankly, has me concerned that I might become a future target for litigation. Since the progress of the project is so early, I decided now is a good time to start to learn how to develop cores using formal verification. I&apos;ve so far "proven" my ROMA core&apos;s slave TileLink port to my satisfaction, and I&apos;m going to move on to working with the SIA. I have implemented the baud rate generator logic using formal verification. So far I&apos;m pleased with the results, but I have to admit, I still have a lot to learn. Will try to keep you folks updated with my progress. I&apos;m pleased to say that the ROMA core is now operational enough to meet my needs. This is not to suggest that it implements the complete and total TileLink interface. On the contrary, it does not. If you send a PUT or PUT_PARTIAL request to the ROMA core, you&apos;ll deadlock, because it just doesn&apos;t know what to do with those yet. (It will eventually, just not at the moment.) However, if you send it a GET request, you&apos;ll get back a 64-bit word containing what you&apos;re looking for after about 97 clock cycles. Remember that the ROM it&apos;s attaching to is a serial flash ROM, accessed one bit at a time. As indicated above, the next steps are to implement the transmit-side of the first SIA core. I do have a SIA core implemented from last year (which is both TX and RX capable), but I&apos;ll be starting from scratch and incrementally copying the design over. This way, I can work towards a formally-verified design from the ground up. The alternative, taking an existing design and adding FV properties to it, takes much, much longer to complete because all the moving parts conspire to falsify your assertions in unforeseen ways. So, by the time I&apos;m done, the finished SIA design will inherit almost everything from last year&apos;s prototype design. The register layout will be different, however. Sometimes, I get burned out by the hardware aspect of the project. When this happens, I often wonder to myself, "Man, if only I had the Kestrel *finished*, then I can work on the software." I reached that point not too long ago. 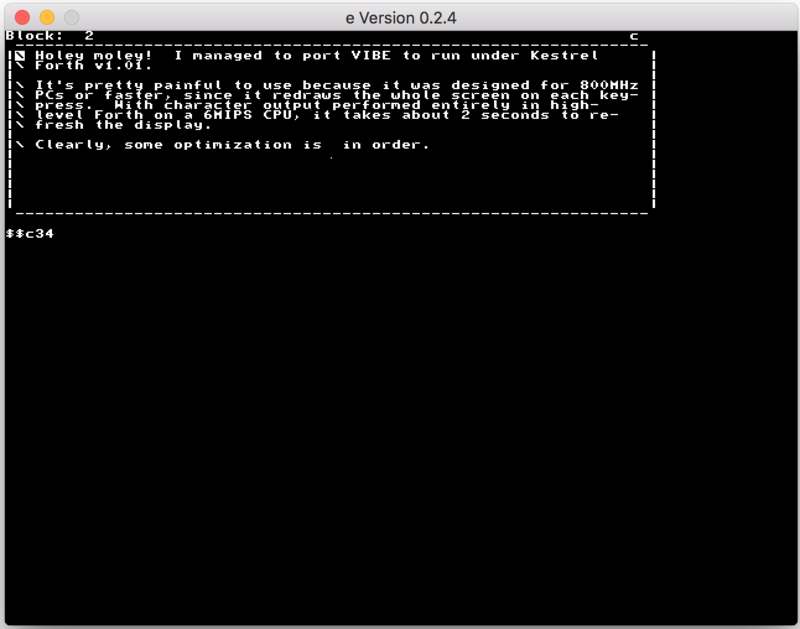 So, I worked on developing a new emulator for the new Kestrel-3 hardware design. It only supports the headless configuration right now (CPU module only; no I/O module). 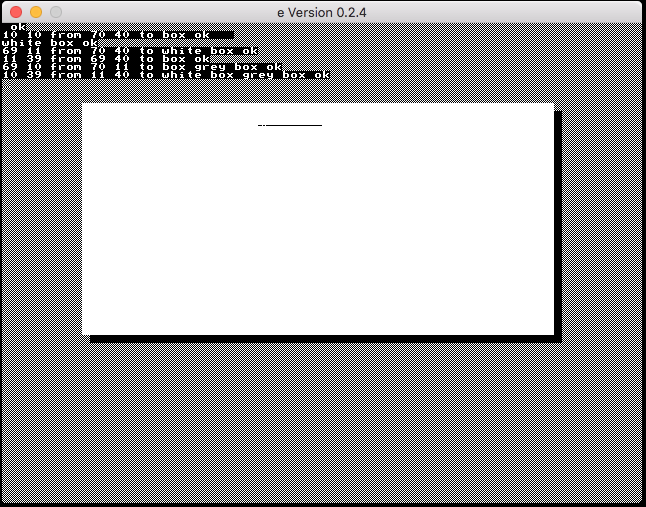 As part of this, I also ported DX-Forth to the emulated environment. Presently, DX-Forth boots and runs, but it has no secondary storage support. It&apos;s not committed to the repository yet, but will be landing soon. I wrote up some of my thoughts about how I could perhaps fit a page-capable MMU into the KCP53010 design for a future Kestrel-3 revision. Whoops! Here's some bulk updates! I&apos;ve been so busy and distracted of late, I rather forgot I had this project website! Recently, I&apos;ve been working on building the Kestrel-3 Verilog sources. I&apos;m starting out with a very simple DMA Controller (DMAC) core, whose responsibility it is to just sequentially scan through memory, and read the results back through a series of attached LEDs. If done slowly enough, this will permit me to read out the contents of flash ROM and confirm that I am programming it and the FPGA bitstream correctly at a human scale. BUT, to interface to the flash ROM, I must further build another core, called ROMA, for ROM Adapter. This will couple the 64-bit TileLink TL-UL interface to the bit-serial, SPI-based interface that the flash ROM resides on. Over time, I&apos;ll be adding more videos, as I find the time to work further on the project. I&apos;ve updated the Kestrel-3 development plans page. These plans seem far more actionable to me than my previous set. All build instructions will be kept up to date (as best as I can!) through my online user&apos;s guide located at leanpub.com/k3ug. I&apos;m happy to see that you still continue with this project. Have you seen my A2Z project here? It is quite a similar project, a full computer based on FPGA, but it is much simpler than yours. I&apos;ve also coded a homemade compiler. I believe I&apos;ve seen it when I first joined the Hackaday community; however, I regret that I haven&apos;t been following up on my interests. Now that I&apos;m fully employed, I tend to focus my free time on my family engagements and, only occasionally, on Kestrel stuff. :) Apologies. You are much further along in your project than I am with mine, though. Right now, my biggest difficulty is getting reliable SD card operation. After that, I&apos;ll need to make some kind of bootstrap mechanism. I&apos;m hoping progress will be more forthcoming once I achieve those milestones. I&apos;ve seen your SVFIG presentation. Congrats for finishing the Kestrel 2DX ! f4hdk - Thanks for the feedback. Finishing the 2DX is a major achievement for me, and is an important stepping stone to achieving the Kestrel-3 design. With regards to your specific question, though, I&apos;ve explained this numerous times in the project logs and even in the video -- I was utterly and thoroughly unable to raise the PSRAM chip on the FPGA board. This leaves me limited to just using the block RAM resources that are on the FPGA itself. If *you* know how to talk to the PSRAM chip on the Nexys-2, I&apos;d sure welcome a patch. Because I tried, and I&apos;ve failed, for about two years. The Kestrel-3 design will target different FPGA boards with 1MB of external SRAM, a significant improvement in RAM capacity. There is also 512KB of SRAM on the DE-1 board from Terasic. That same board also has 64MB of SDRAM. However, I refuse to even try to use SDRAM. I&apos;ve learned my lesson. Avoid SDRAM like the plague. But, again, if you have an SDRAM controller that works and is license-compatible with MPLv2 without me having to relicense the project as a whole, then I certainly will not turn away a patch to make SDRAM work. I would like to learn Forth someday, I like the simplicity of stacks (which reminds me of my Magic the Gathering days). Not having to name every intermediate computation is quite liberating. But if taken to an extreme, it can also be quite confusing. :) The solution is to learn to hyper-factor your code. A single function in C could well take 16 word definitions in Forth. Naming procedures is a nice trade-off, because it almost serves to document why your code is the way it is. Not quite, but good enough for most purposes. :) Plus, it really aids in testing code to make sure things work as you expect them to. Nope, and I have no intentions to either. I&apos;ve invested too much into RISC-V to change now. Switching ISAs today would literally set me back two years of effort. Besides, performance of RISC-V CPUs are quite good in general; that my own CPU is as slow as a 68000 should not be taken as an indication that all such CPUs are that way. In the future, I&apos;d like to one day hack a BOOM processor into the Kestrel, which would give it a 4-way superscalar CPU. But, for now, I just want something simple enough that people can understand. Another reason for adopting RISC-V is that it has learned many things from both the successes and the failures of past architectures. An Open Source fully hackable game console packed with features. Based on the Pentium III CPU! You are about to report the project "Kestrel Computer Project", please tell us the reason.